We’ve been variable with regards to Ovie Ejaria around here. Some of us on the site loathe him, some are less strict on him, and some love him. However following last night’s latest mediocre display from the Liverpool loanee, we have to say it’s become clear after five+ months at Ibrox he is not remotely developing as an attacking or creative midfielder and that ‘experiment’ has failed. Ejaria once said in his Liverpool youth days that he saw himself as a goalscoring midfielder – and that he’d work on getting more attempts in the onion bag. Well, it ain’t happening fella, and it’s making his selection curious. As a purely ball winner and metronome, he is actually rather good. He’s strong on the ball, mostly, and usually manages to find a team mate at the end of it. But only in his own half or modestly into opposition territory. When it comes to advanced attack, he barely has anything to deliver, is unable to feed the flanks, is mostly dancing around the edge of the area and then laying the ball off before drifting back, and ultimately is not able to affect the final third on a meaningful level. Which, ultimately isn’t his fault – he just hasn’t grown as that kind of midfielder. As mentioned, though, he is very decent at the deeper work – breaking up play, using his body to shield and protect the ball and supply nearby mates with possession. But this then raises a problem – Steven Gerrard is ultimately playing with three defensive midfielders – a midfield which has three gritty, harrying ball winners by trade, while trying to turn one of them into an AM, one into a CM, and keep one doing what they do best. And Ejaria’s game isn’t conducive to good play where he’s being forced into, and it renders the midfield imbalanced when he’s there. Last night it was Jack, Coulibaly and Ejaria – that’s three of effectively the same players, asked to do different roles, with only one in position. Now, we know Gerrard craves a new AM – he’s said to be looking at Everton’s Kieran Dowell and of course he lost Graham Dorrans. There’s Carlos Pena but we’ll cover that in another piece. So ultimately creativity at the apex of midfield is chronically absent. 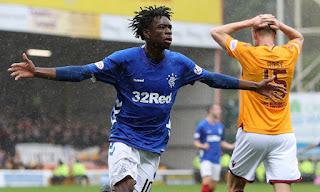 Ejaria has not grown into the player he probably thought he would and Gerrard hoped he would, and it leaves us with a slot we have no real valid player for. Unless, of course, we change formation. We’ll see what Stevie concocts at the weekend. I wish he would give Halliday the chance as the attacking midfielder. That's his his natural position. He is the only 1 that will play a forward pass or have a decent shot on goal. I can't understand why he's constantly overlooked and only played out of position. If Rossiter is fit then he should be playing, I know he is a defensive mid aswell but compared to the rest he's far quicker, dictates tempo, drives the team forward and is far better than coulibaly and ejaria. Can we not send ejaria back in January? He's woeful and genuinely not needed as CDM. I think we could do worse than try to convert Jack into a number 10. I think he's our most technical midfielder, his strength, close control and passing is superb. When he breaks forward from deep, it nearly always turns into something decent, although he often drops back into position straight after. Could he be more effective than Ejaria if he stayed forward? Wouldn't be hard, to be honest. Personally, if his main job was finding a way through defences, I think he'd get a load of assists and goals, just don't think he sees it as his main job/does most work from deep. I was never the biggest fan of Halliday and I think he is at best a good squad player! - But I'd play the boy over Ejaria every single day of the week. Much more of an attacking threat, more heart, can score goals, can hit freekicks, will never give up...Yes,I'd like to see someone better than Halliday with real quality but for the moment it's a crying shame Halliday is sitting on the bench watching Ejaria do nothing! Same with Wallace watching Flanagan being ripped apart week in week out. I think that's a disgrace..
We are playing with 3 gritty ball winning midfielders , really .Why is it then we don`t dominate midfield and allow thugs from the other teams to bully us .Witness Shinnie last night a limited footballer who just kicks and fouls his way through the game ,yet we let him boss it .Ejaria is a nothing player who doesn`t tackle , falls over a lot and cannot pass forward .Last season Ross McCrorie dominated these games and as a result we won 3 and drew 1 with a far poorer team.Give the boy a chance I say. He lacks in courage, for me. Has he got skills? Yes, most definitely. But he lacks that courage to get stuck in and take a few midfielders and defenders on. It's true, he doesn't tackle enough. The boy needs man-managed, because I think he's got it in him, to be better. He just needs to grow some cohojnes. But to be fair to him, he's not the only one, guilty of that.